gether to laugh, catch up, and enjoyed really good food. 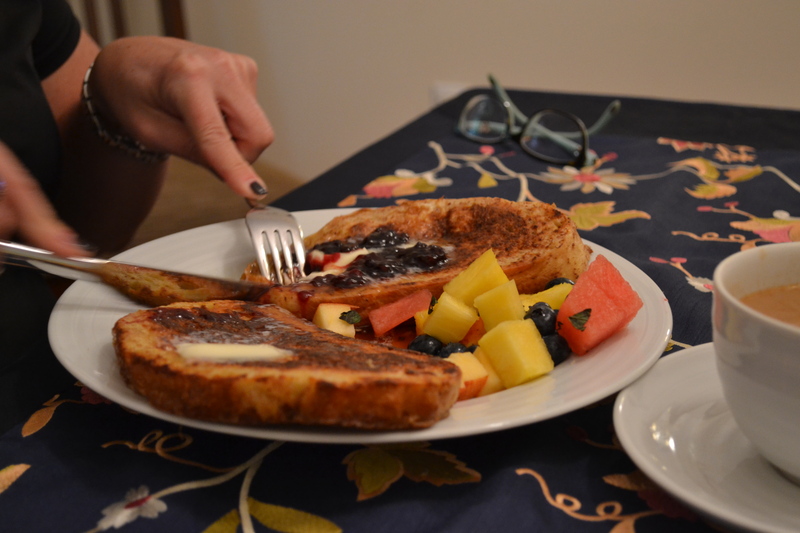 We had scrambled eggs, a fresh fruit salad, I made french toast, and a friend hosted the meal at her house. Nothing says “brunch” like french toast. 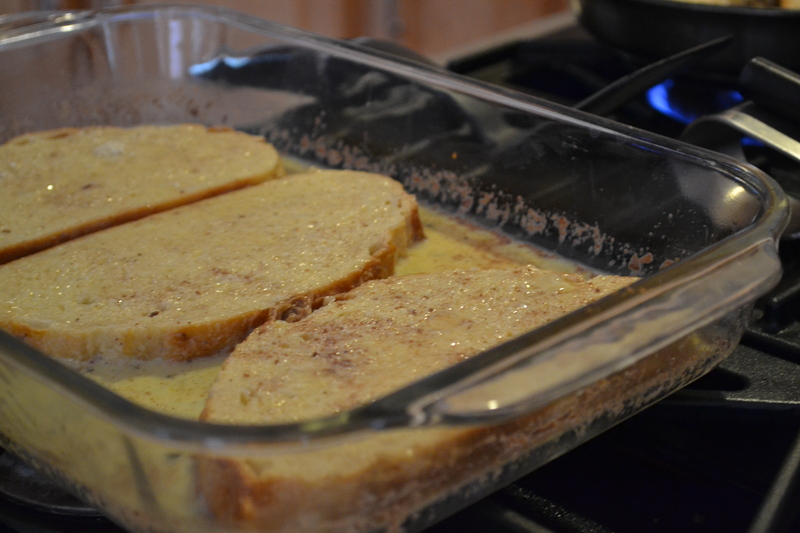 The key to good french toast is the bread. The best bread for french toast is sourdough that is a few days old. 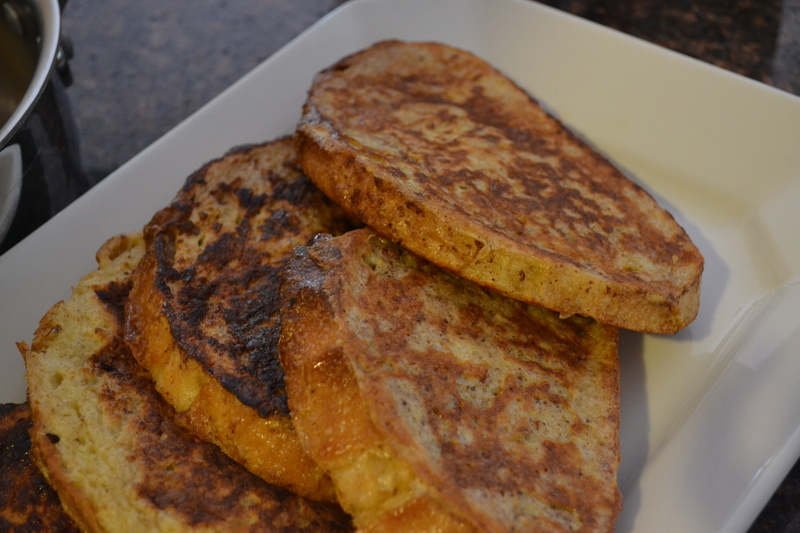 So I suggest buying your bread on a Tuesday or Wednesday to make french toast on the weekend. As always, my choice is Bread SRSLY. I don’t only rely on them for traditional sourdough bread, they also offer a flavor of the week. And I suggest you try their kale bread, it is truly mouthwatering and would be fantastic as french toast. If I don’t have any SRSLY on hand, I will use Udi’s white sandwich bread. Remember, your meals will be defined by the quality and creativity of your ingredients. Adding your own combination of spices can help create a more playful and complex flavor. 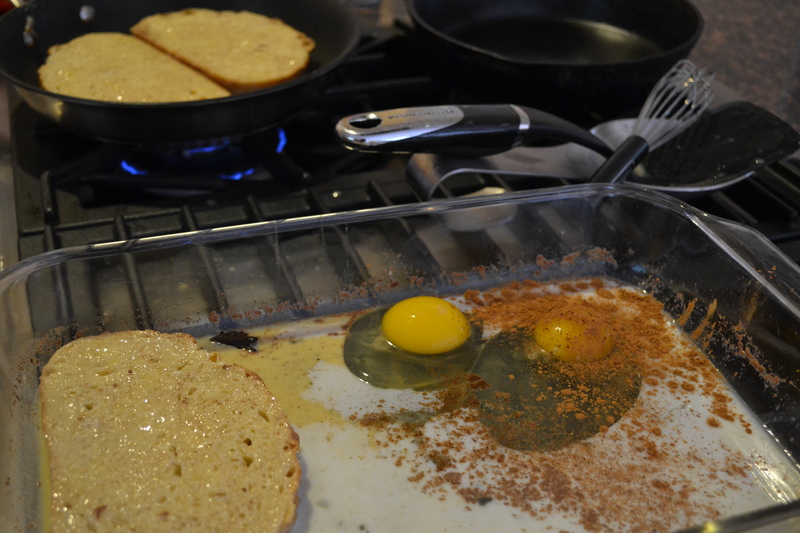 I like to use cinnamon and nutmeg in my french toast recipe. In the fall adding some pumpkin pie spice also brings a new dimension to the meal. 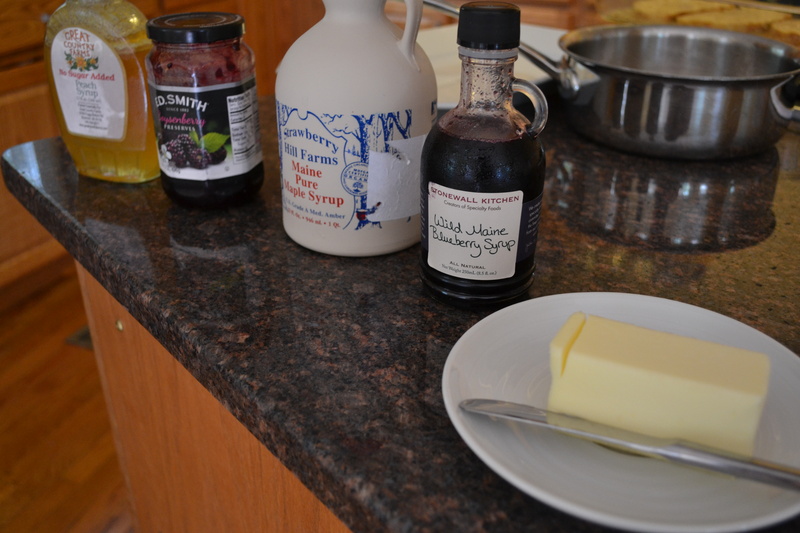 Using quality eggs, milk, syrup and any other toppings will take your french toast from ordinary to extraordinary. Each ingredient in a dish can intensify and deepen the taste experience. For a truly memorable meal for any day of the week choose fresh, quality ingredients. Hostess Tip: Use a spice grater for fresh spices to intensify flavors even more. Since the pot luck was at a friend’s house, I kept in mind that it can be an adventure to cook in someone else’s kitchen. It is a blessing to not have to do the cleaning and staging yourself. Allow this to free you up to have a different perspective as the cook. We can tend to get into ruts and routines when preparing meals in the same environment day after day. Let a fresh environment and different cooking tools inspire, not intimidate. But don’t forget to come prepared with specific cooking items you know you will need for your recipie. The hostess has, most likely, thought through all your possible cooking needs, however don’t expect them to know everything your recipe requires. Being prepared when cooking in a friend’s kitchen is a form of hospitality! Hostess Tip: Bring an assortment of Tupperware with you. This will make giving your friends (and yourself) leftovers much easier! Our pot luck brunch allowed each guest to chose the food they wanted to eat and created an informal atmosphere perfect for catching up. When the morning ended and I took my friend to the airport, I was satisfied that this brunch was a perfect way to spend time with a bless a cherished friend. 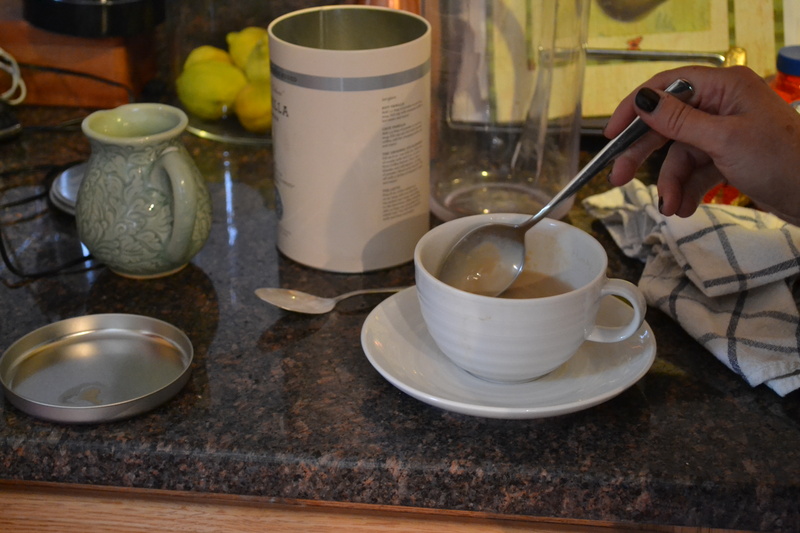 Hostess Tip: when having a brunch party make sure there is good coffee and tea selections. It is the appetizer for brunch, and gives the cooks a little extra time to finish last minute details. Dice up the apples, watermelon, and pineapple. Place each fruit in a quarter of the bowl. Cover and refrigerate until ready to serve. 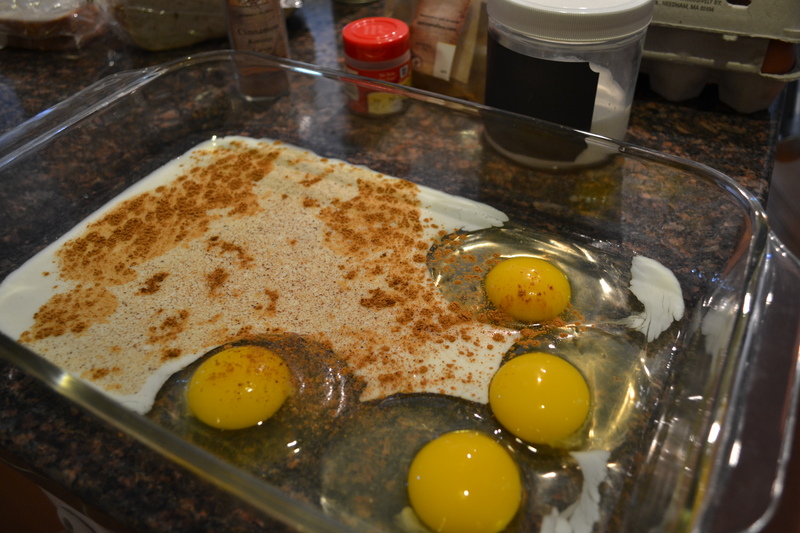 In the casserole dish add 3 eggs and scramble while adding milk until a pail yellow color. Add spices and mix until combined. Dip as many bread slices as will fit on the cooking surface into the mixture and let soak for about 2 minutes per side. You do not want the bread falling apart but you do want the mixture to soak in. While the bread is soaking, pre-heat the frying pan or skillet over medium heat. Add some coconut oil and fully coat the cooking surface. Once heated place the bread slices on the cooking surface until golden brown, about 3-5 minutes depending on the strength of your burner. Flip the bread and repeat on the other side. As this batch is cooking repeat the coating and soaking of another batch of bread. As the egg mixture gets low add the remaining eggs and repeat with milk and spices. 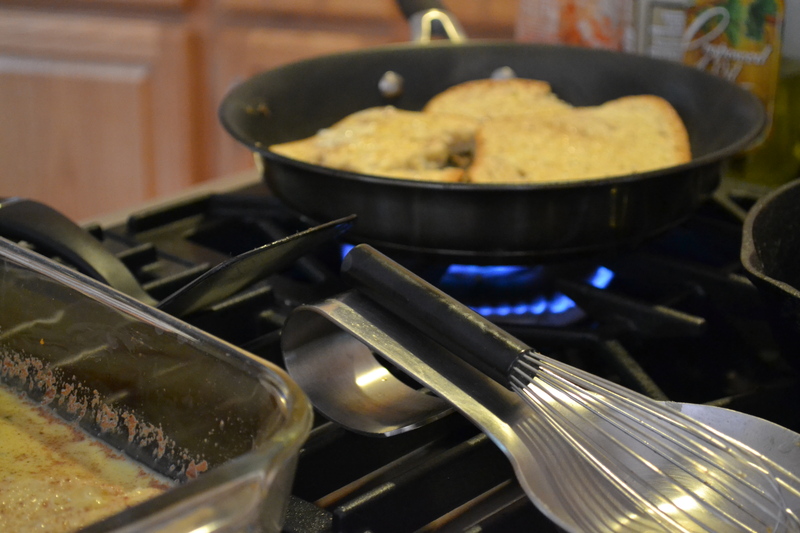 Just before you are ready to serve brunch, and after the french toast is completed, heat the save cooking surface for the french toast. Add butter to pan and coat surface completely. While heating break and scramble the eggs in a bowl. Add to hot surface moving constantly to keep them scrambled and not omelet like. Serve immediately with salt and pepper sprinkled on top. Set the coffee and tea bar up first so guests can serve themselves as they arrive. Arranging the selections, including mugs or teacups, on the counter or a table you have designated. 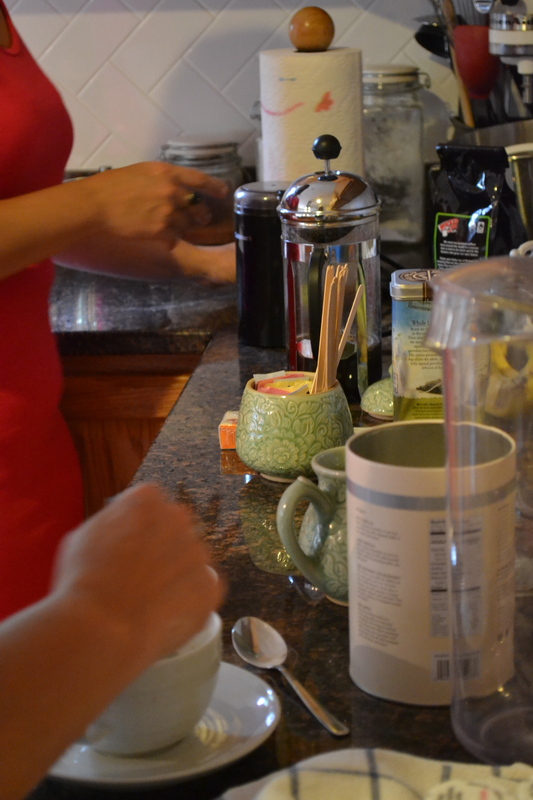 If you are using a french press for coffee add the hot water to brew as the guests are scheduled to arrive. Put the hot water for tea selection into a teapot. 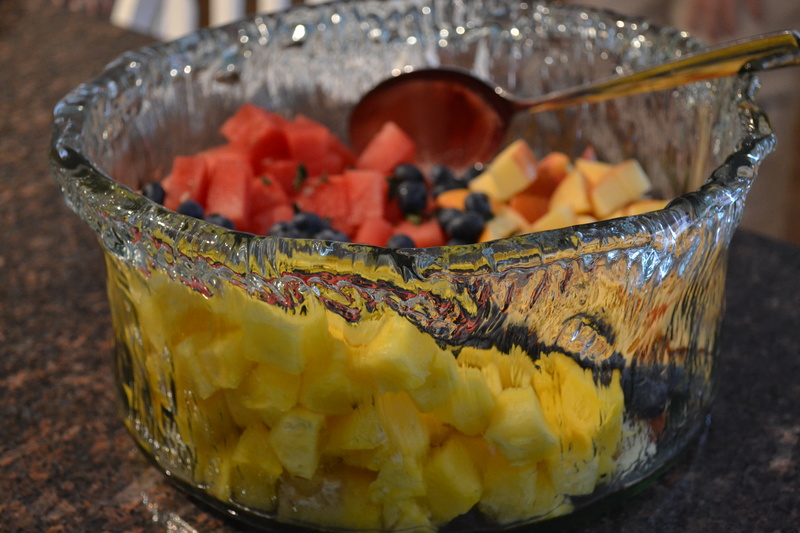 The fruit salad can be placed on the pre-set table or serving bar just before guests arrive. 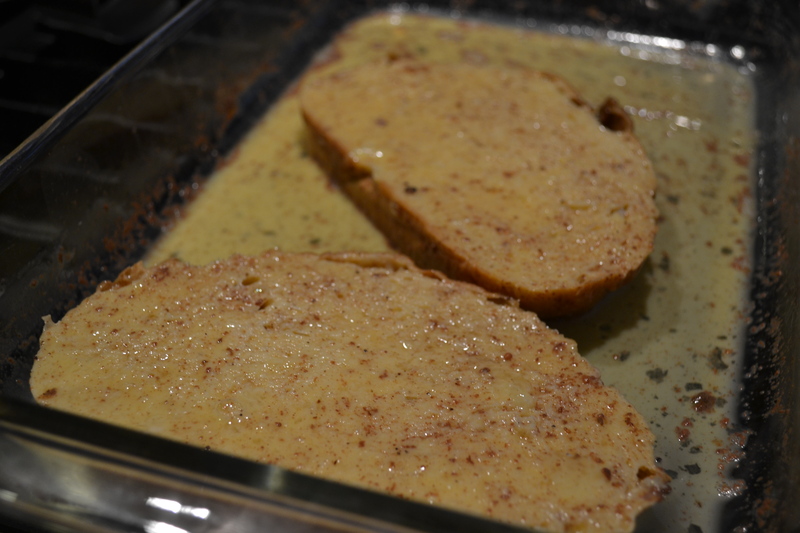 As the french toast is finished arrange on a serving platter and sprinkle with topping, if desired. Arrange the scrambled eggs on a serving platter and call everyone to eat. This brunch works particularly well served buffet style and allows the majority of the mess to remain in the kitchen. Love!! I WANT French toast!! !